I’m very excited because yesterday, I discovered the origin of the word taxi! And it’s Parisian. Who would have imagined that? I learnt about it while taking some Australian friends on a walking tour that included the oldest houses in Paris. Paris has lots of street signs explaining its history and we came across one that talked about the invention of the fiacre. 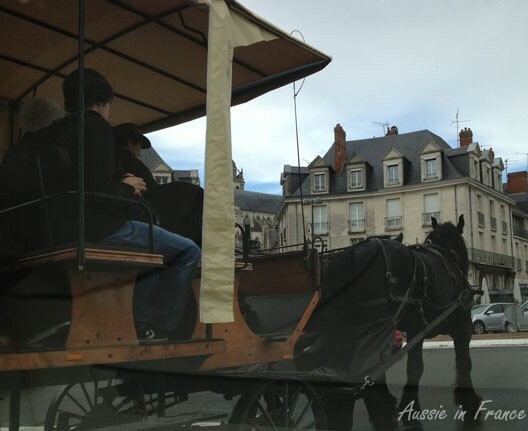 In 1612, a coach company from Amiens rented a house in rue Saint Antoine in Paris, bearing an effigy of Saint Fiacre, the famous barefoot friar (carme déchaussé, if you’re interested) who predicted that Anne of Austria would have a son (one chance out of two, as my friends pointed out). He’s also the patron saint of gardens. In any event, Saint Fiacre eventually became a sort of Saint Christopher and his image was displayed on coaches all over Paris to prevent accidents. Ever since, coaches have always been called fiacres. Just before the French revolution in 1789, there were about 800 of them parked on 33 stations including more than 650 under shelters called remises. The coach drivers had a terrible reputation and the police did everything they could to control them. Each driver had a number that cost a fortune to buy and a booklet containing their licence to park and drive the coach. After reaching their zenith at the turn of the 20th century, horse-drawn carriages declined and were replaced with the automobile. 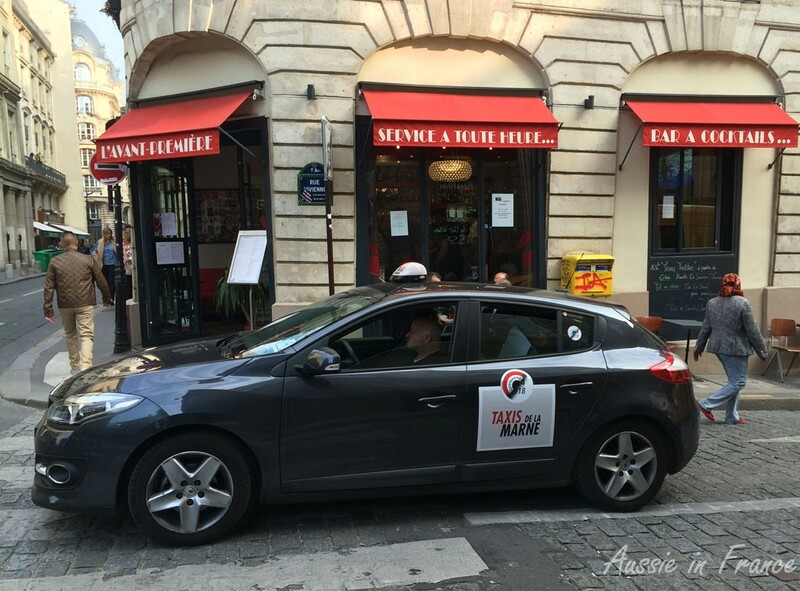 The name of taxauto was soon adopted, followed by taxi, which is an abbreviation of taximètre and designated not the taximeter, but the vehicle containing it. The term taxi took over completely after a famous historical event in the first world war known as the “Taxis de la Marne“. On 7th September 1914, in order to reinforce the Maunoury army, General Galliéni requisitioned 700 Parisian taxis to ferry the 7th division troups from Sevran, Livry and Gagny in the east of Paris (i.e. the Marne) to Nanteuil-le-Haudouin and Plessis-Belleville in Picardy, which represented a distance of about 40 kilmeters . The meeting point was boulevard des Invalides. During the night, with four men to a taxi, most of the division was transferred, totalling more than 5,000 combatants, a somewhat modest number compared with the Maunoury army’s total of 140,000, but the story has gone down in history. You can find more details here. 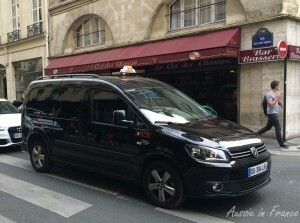 And would you believe, when I was taking my photo of a Parisian taxi, I accidentally took one of a Taxi de la Marne, even though I had never heard of it before! But since it’s a modern cab, I checked it out and learnt that during the recent centenary – 7th September 2014 – a reconstitution took place with 10 originals taxis and 120 modern ones bearing the insignia shown on the photo as well as a number of military vehicles as you can see from the video below on the France 3 regional television website. I wish I’d known at the time! This entry was posted in French language, History, Uncategorized and tagged origin of fiacre, origin of taxi, parisian taxi, taxis de la marne. Bookmark the permalink. Driving soldiers to the front is a novel idea! Yes, it is an interesting concept, isn’t it? Every car event we’ve been to this year has had one or two of the original taxis de la Marne on display. One of the big champagne houses (Taittinger?) owns one. It’s a great story. I wondered if you’d come across them! No, I didn’t know the story ofAnne of Austria’s pregnancy. Just goes to show what a little presence will achieve! Very interesting history of the taxi. It seems to me that policemen had their noses into people’s businesses since very old times, trying to “regulate” and control them whichever way they could. Yes, though it does explain the reputation of Parisian taxis!